An all time favorite dessert is the cannoli. The fresh blueberry filling is easy to make fresh at home. You can whip up a batch in very little time, and it is worth it! Place ricotta in bowl, and with electric mixer, beat ricotta until smooth and creamy. Beat in confectioner’s sugar, vanilla, lemon juice, lemon zest and blend until smooth. Taste, add additional sugar, lemon, or vanilla as needed. Transfer to another bowl and stir in blueberries. Chill until firm. When ready to serve, fill a pastry bag fitted with a 1/2-inch plain tip, or a ziplock bag, with the ricotta cream. If using a ziplock bag, cut about 1/2 inch off one corner. Insert the tip in the cannoli shell and squeeze gently until the shell is half filled. Turn the shell and fill the other side. Press or dip the cream filling at the cannoli ends into chopped pistachios, grated chocolate/mini chocolate chips, candied fruit, or zest. Dust with confectioner’s sugar and/or drizzles of melted chocolate if desired. 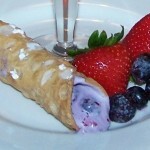 Or, another option would be to, spoon some of the warmed blueberry sauce over the filled cannoli shells.